Coloring Broadway will be hanging out at Show-Score’s Tony’s Viewing Party - Celebrating Broadway’s biggest night with Broadway’s best fan community. To the Revolution! On Monday, June 18, 2018, Broadway Sings for Pride will premiere their 8th-anniversary benefit concert in New York City at The Cutting Room at 7:30 pm! This milestone event will be filled with singing (from pop to Broadway), stories, special guests and of course, fun! The proceeds will benefit The Tyler Clementi Foundation. The one-night-only benefit event, entitled ” REVOLUTION”, will feature the best in New York and beyond from the world of theater, film, & television. Coloring Broadway has partnered with Broadway Sings For Pride to create a special Revolution Collection featuring fan-selected Broadway lyrics! On Monday, June 18, 2018, the theater world and New York communities will come together for Broadway Sings for Pride's 8th annual charity concert entitled "Revolution"! Hair co-creator James Rado(Grammy-Award Winner) and Hair original choreographer Julie Arenal(Broadway/West End) will join over 35 tribe members to celebrate Pride with a special Hair reunion musical performance during the event. Cast members from the multiple Tony-award and Grammy-winning musical will include Original Broadway Cast, Broadway, Broadway revivals, film, national, international, regional cast members. Coloring Broadway is excited to partner with Broadway Sings for Pride and to witness this once in a lifetime celebration. You know our Revolution! Coloring Collection will obviously feature a quote from Hair! 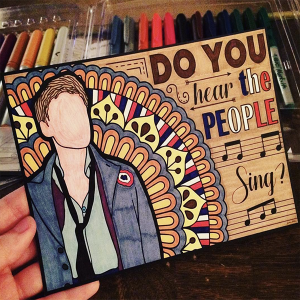 Hamilton Shared Our #HamArt #FanArt! On Friday, May 6th, I was at a bbq with friends when my phone started to buzz, REPEATEDLY. What the heck is going on? The buzzing was orders coming in from Etsy. Order After Order! Justine (our artist extraordinare) texted me - she didn’t know what had happened either! It wasn’t until some wonderful soul shared this link with us and told us that HAMILTON had shared our picture across their social media! We had only launched Coloring Broadway on April 4th, one month before this. We spent the next few days with smiles on our faces as we fulfilled all the coloring orders - Singing along to Hamilton the whole time, of course! And for Christmas last year, Hamilton Official gave us the best gift of all - they shared another pic of our artwork - this time a #fanart of our #HamArt pic! Needless to say - we are humbled and thoroughly grateful for all that Hamilton is every single moment of every single day. Show-Score - the trip to NYC that kicked it all off. 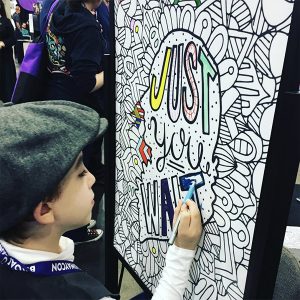 In early May of 2017, when Janie from Show-Score reached out to ask if Coloring Broadway would be interested in participating in a FanArt event they were having - Little did we know they were kicking off what would be a domino effect of trips to NYC for Coloring Broadway in 2017! The amazing team at Show-Score are our heroes and have become some of our greatest supporters! Will was a kid who loved to play - he would create worlds of his own using a toy theatre he made himself. Now that Will is an adult - He’s created that toy so that others can experience the joy of creating worlds and filling them with different characters and stories. So - obviously - Will and I got along swimmingly. This is the interview that came out of our new friendship! 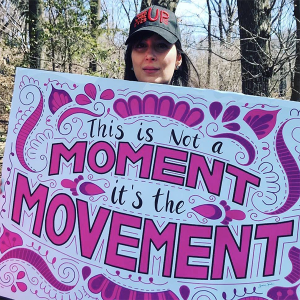 This is Not a Moment, It’s the Movement! When Musical Theater, March for Our Lives, Gillian Pensavale from The Hamilcast and Coloring Broadway join forces, here’s what happens! P.S. can I tell you how much I admire this woman who created the thing that didn’t exist! Where Theatre and Psychology Intersect: Our interview with the amazing Alisa Hurwitz, aka Dr. Drama. This woman right here. She just gets us! 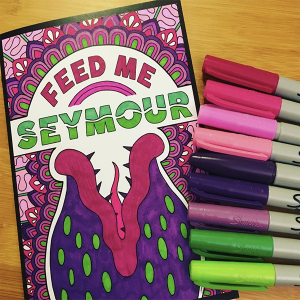 You had me at “Yes, Coloring can be therapeutic”. Alisa and I bonded over the ability of theater to talk about and demonstrate the full complexity of human emotion - and, through this, offer an avenue to better understand yourself and maybe humanity. Obviously, we are having a, wait … what’s the term for a “bromance” between two women? Well, we’re having that. Human Connection through Theatre - Why Yes, Of Course! How often do you meet someone and just click? Ok, well I think that might happen more often in the Theatre community, but that doesn’t undercut the great connection that I had with Stefanie Kahanov - an interview that was meant to last 60 minutes had us talking for 3 hours! But I guess that’s what happens when you start talking about the transformative power of theater! Become a part of your favorite musicals! Add your own color to the Broadway quotes that uplift and inspire you.